Here comes 2019, Year of the Pig, the 12th, and last of the 12-year cycle of animals in the Chinese zodiac. Chinese Lunar New Year, a culturally significant holiday equal in importance, family, and optimism to Christmas in the West, is also a crucial opportunity for luxury brands to bump up retail sales. So several fashion, beauty, jewelry and watch brands are offering themed products for the holiday that kicks off Feb. 5. Such Lunar New Year editions always draw a lot of attention, both inside China and globally, in part because consumers look to see how the international brands will interpret Chinese culture. With the Chinese luxury consumer (especially the younger generations) becoming more important in generating revenue, and a rise in national pride and cultural sensitivity, luxury brands need to be cautious on such cultural interpretation. Louis Vuitton has crafted a pricey pig keychain ($435 (RMB 2,948)) to celebrate the Chinese Year of the Pig, made of “Monogram Eclipse” canvas and leather. The eye of the pig is a classic stud used in the Louis Vuitton trunks. Dior, a brand that creates some New Year pieces solely for the Chinese market, has been known for issuing a Chinese zodiac redline bracelet every year. But Chinese consumers have made some critical comments online in past years on its design. So this year, instead of featuring a charm depicting the exact shape of the animal of the year, for 2019 the new Diorelita bracelet has a flower instead of a pig. While several brands have been celebrating the Lunar New Year for quite some time, Calvin Klein is ringing in the Year of the Pig with the launch of its first Chinese New Year capsule collection across its three core brands: Calvin Klein Jeans, Calvin Klein Underwear and Calvin Klein Performance. A bold red and gold color palette sets a celebratory tone. It’s the second year of family-owned French accessories brand Longchamp collaborating with Chinese fashion influencer Mr. Bag, releasing a New Year capsule collection. A lighthearted selection of products featuring piglet curlicue tails, snouts, and pink accessories, Longchamp says the pig is a symbol of abundance and wealth. A small, foldable transparent purse is $420 (RMB 2,845). The witty monogrammed coin purse (priced $250 (RMB 1,695)) by Gucci captures the pig from ears to tail. Besides themed handbags, in its Cruise 2019 collection Gucci also revealed some Year of the Pig fashion: Embroidered cartoon pigs on sweatshirts and handbags. And, like Dior, this Italian luxury brand also creates special Lunar New Year editions just for the China market. In honor of the festive holiday of renewal, Bally is offering key accessories in the celebration’s trademark color — red. The Janelle Bag retails for about $1,495 (RMB 10,130). Heritage skincare line Erno Laszlo has a new Lunar New Year Skincare Set (priced $153 (RMB 1,037)) that launched on January 14. It contains a full-size skin treatment set, a full-size sleep mask and a full-size box of its eye serum mask set. It’s the eighth year of Piaget releasing a limited-edition watch themed to the Chinese zodiac. This year, the special edition of the Altiplano series (priced $71,250 (RMB 483,000)) follows the pattern and design of last year, placing the Grand Feu pig in the center. The profile of the pig is depicted with golden Cloisonné, with support from the noted watch enamelist Anita Porchet. 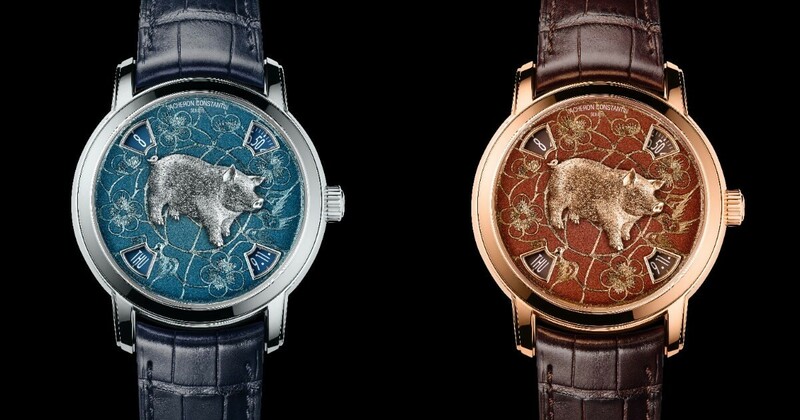 Vacheron Constantin started “The Legend of the Chinese Zodiac” series in 2013, Year of the Snake. This year’s design (priced from $110,593 to $134,604 (RMB 750,000-912,500)) puts a porcine mascot front-and-center. Chopard released this “L.U.X. XP” watch this year, limited to only 88 pieces. Chopard invited Japanese Maki-e artist Kiichiro Masumara to design; the result is a particularly happy looking animal.